Peoria, Arizona, is the sixth largest city in Arizona with regard to land area, spreading out over 141 square miles. And Peoria is the ninth largest city in the state with regard to population. Peoria lies northwest of downtown Phoenix. Peoria is bordered by Phoenix and Glendale on the East, and Sun City on the West. The city boundaries also extend over two counties — Maricopa and Yavapai, with the bulk of Peoria being in Maricopa County. Money Magazine has recognized Peoria as being one of the Top 100 Places to live in the United States. It might not be apparent to the naked eye, but this suburban city of more than 154,000 began as an agricultural hub for the region. Peoria was first settled in the 1800’s when settlers from the Illinois town of Peoria settled in the area and began growing crops for food. The amount of farmers soon increased and Peoria became known as a rural Arizona farming town. That changed when in the years after World War II, particularly after incorporation in 1954, in the 1960’s after the Del Webb’s Sun City master-planned retirement community in neighboring Sun City opened. Soon, developers began eying the area around Peoria. By the 1980’s, more master-planned communities were being built and the population began increasing in double digits. In the period between 1980 and 1990, Peoria’s population grew 316 percent from 12,171 to 50,675. Between 2000 and 2010, the population of Peoria increased to 108,364, according to U.S. Census figures. Today, Peoria is an idyllic suburban community in which to live, with amenities one would expect to find in modern cities of its size. The city is near to Luke Air Force Base, and home to the Challenger Space Center, Peoria Center for the Performing Arts, and the Peoria Sports Complex, which is the spring training home for Major League Baseball’s Seattle Mariners and San Diego Padres. Peoria can legitimately claim that it’s the center of shopping and dining for the West Valley. A number of great shops can be found around the Peoria Sports Complex along the Bell Road Corridor immediately off the Loop 101. On 83rd Avenue (south of Bell Road) shoppers and diners will find an incredible array of choices, both locally owned and nationally based. Park West Mall offers a huge number of shopping and dining choices. The mall brings together local retailers and nationwide chains in a 250,000-square-foot, open-air shopping and dining paradise. It’s located a mile from the NFL’s Arizona Cardinals football stadium and contains charming reflecting pools plus outdoor fireplaces for use when the sun finally falls over the horizon. Some of the stores you’ll find at Park West are The Children’s Place, Dogs Etc., WineStyles, Olive Gourmet, Victoria's Secret, Vans, and Bath & Body Works. Park West also hosts Momma's Organic Market on Saturdays from September to April. It’s a great place to buy fresh produce and enjoy family-friendly activities including a petting zoo. When it comes time to enjoy a bite to eat or a refreshing beverage after a day of shopping, Parkwest is home to local favorites such as Coffee, Tea & Me, Sandbar Mexican Grill, Fleming’s Steakhouse, Rustica Café & Bar, and BJ’s Restaurant & Brewhouse. Peoria is home to its very own “Restaurant Row", which is the area surrounding the Arrowhead Fountain Center and the Peoria Sports Complex. Taking a stroll down Restaurant Row, a hungry diner will find nearly 40 upscale restaurants featuring a diverse assortment of world cuisine, including Japanese, Chinese, Mexican and Italian, as well as American standards, like steaks, chops, burgers, and, of course, authentic flavors unique to the southwestern United States. 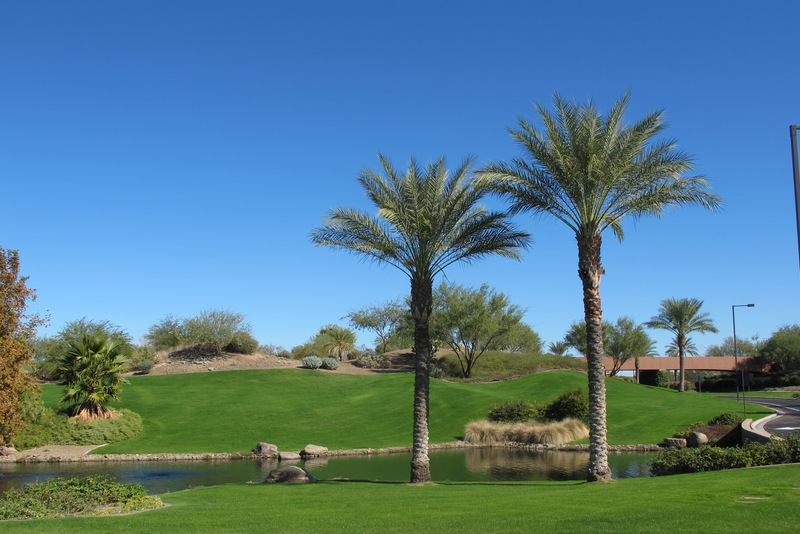 Peoria and its nearby neighboring communities enjoy an enviable location. Though surrounded by other metro Phoenix cities, Peoria is near to several exquisite biking, hiking, walking and jogging trails, and numerous multi-use neighborhood and community parks. The City of Peoria Community Services Department operates and maintains 17 parks, three golf courses and two swimming pools, in addition to a community center where people come to participate in a variety of organized activities. The City also provides 15 public tennis courts and nine multipurpose sports fields that are equipped with lights for nighttime games. One of the parks, Rio Vista Park, features several lighted softball and little league diamonds, a splash park, skate park, multi-purpose sports fields and even an urban fishing lake. Rio Vista also has a 51,000 square foot Rec Center. The park connects to several trail systems. For those who want to take part in recreational programs, activities and classes, the City’s Recreation Programs division administers a broad range of activities suitable for all ages and abilities. Some of these offerings include after school programs, summer programs, aquatics programs, adaptive recreation programs, senior programs, outdoor recreation, and special interest classes. Residents of Peoria enjoy more than 300 days of sunshine each year. The city offers convenient access to both tremendous outdoor activities and virtually limitless entertainment and shopping opportunities, so Peoria continues to attract residents. Arts and entertainment are available locally on a small scale. With the close proximity of Phoenix, however, entertainment and sports options increase exponentially. Those craving sporting events, theater or opera can drive a half hour to downtown Phoenix where a variety of popular activities are available. The Arizona Diamondbacks Major League Baseball team call Phoenix home, as do the Phoenix Suns professional basketball team and the Arizona Coyotes professional hockey team. The Arizona Cardinals professional football team plays at the multipurpose University of Phoenix Stadium, in the Phoenix suburb of Glendale. There are also numerous movie theaters in Peoria, as well as the Arizona Broadway Theatre, where live stage productions are held to appreciative audiences. The Peoria Unified School District operates 32 elementary schools and seven high schools within the community. Parents also have the option to choose from a number of charter schools, which are paid for by state educational funds that would have gone to the public schools. Peoria is home to several private schools including three that teach in the Montessori style. Most of Peoria’s Pre-K-12 public education falls under the purview of the Peoria Unified School District; however, some neighborhoods are in the Deer Valley Unified School District and a few others are served by the Nadaburg Unified School District. Peoria has a robust medical community with family doctors and dentists and many accepting new patients. For emergency medical needs, there are Urgent Care facilities and a hospital. Nearby medical facilities can be found within minutes in Glendale, Sun City, and Phoenix, and include Banner Estrella Medical Center and Arrowhead Hospital. Valley Metro operates bus service and light rail service to and from Peoria. The transportation also provides a Dial-A-Ride service, which accommodates wheelchairs and which any resident can use. For those that are flying in from out of area, Phoenix Sky Harbor International Airport is only 20 miles away. To work with a team experienced with listing and selling Peoria Residential Real Estate contact Tony & Suzanne today! Search for Peoria Area Real Estate Now! Hi Tony and Suzanne. Thanks for the great information about Peoria, Arizona. Those looking for real estate in the area should give you a call. Gabe Sanders Thanks for stopping by and for the appreciation!